Remember, there is a post-credits scene that is actually important for us (so tell your friends to stay and don't let them walk out early!). Tony will be on a couch, talking about certain experiences in the film to Bruce Banner (Mark Ruffalo) who wakes up and tells Tony he's "not that kind of doctor," and then goes back to sleep. The exact moment Tony describes to Banner (or at least thinks he is) is the moment we should consult for understanding Tony and the film because that's what Tony is seeing as the most important thing that has happened in this adventure. Remember, if the film is doing psychoanalysis, it wants us to do psychoanalysis, and one of the issues in the film assuring us of that is that Tony can't sleep. If you are interested, the entire plot synopsis is here if you want the spoilers. I prefer to know what is going to happen because I catch details better, but you may prefer the surprise. 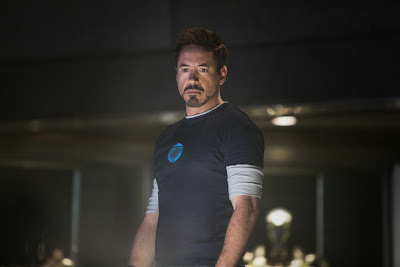 In Iron Man 2, we learned that Tony didn't like to be handed things, and it carried over to The Avengers; is that still a trait in Iron Man 3? Has Tony finally become secure enough with himself and what he can do that he has overcome his psychological tick? "Heroes, there is no such thing," the Mandarin tells the world, and, to socialists (I am not saying the Mandarin symbolizes socialism, however, this is a position we have come to know) heroes don't exist because they stand out from the crowd and that's bad because heroes pose a threat to the Socialist Party so they have to be hauled off to the Gulag or just flat-out killed. Not being able to sleep is quite serious because if we aren't sleeping, we can't dream and this has physiological consequences as well as emotional. One of the traits of schizophrenics is that they don't have dreams the way most people do. On at least some level, we can apply this emotional break-down to Tony; the good thing, however, is in one of the clips we have seen when Tony talks to Pepper about getting up at night to go to his work shop to "tinker." Instead of just dreaming--we can apply a play on words--Tony is doing, and not just fantasizing about things to build, but building them. The film will sort all this out for us, but we should pay attention to when Tony does sleep and when he does not, if he has any dreams or if it is possible that Tony falls asleep and everything in the rest of the film is a dream.... or a nightmare. It seems that Pepper wears a lot of white, at least from what we have seen so far. The color she wears and when she's wearing it will be a key to understanding what transformations her own character goes through. Something else I have also noticed is the bright red lipstick she wears when her and Tony talk about New York (she wears a white business suit). We know that red is the color of love or the appetites, and that it's on her mouth specifically refers to her appetites, the question is, when her character is in the white suit (either as a show of her faith or innocence, or that her faith is dead) what appetite does she express in that scene? Are her words a true statement of her love for Tony, even though they might be harsh? Or, does she use her words to tear Tony down to build herself up? 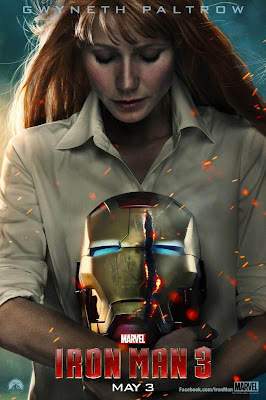 Remember, she thought she could run Stark Industries better than Tony in Iron Man 2 (well, all of us probably thought we could run Stark Industries better than Tony, and its to Pepper's credit that she humbly confessed she couldn't. This poster, however, probably communicates exactly what we are looking for: the Iron Man helmet is "defaced" with the crack. Psychologically, this could be a key component of understanding Tony Stark psychologically because the face is a special part of our identity, and for the helmet to be torn might refer to Tony himself being torn over who he is and what he is (is he only great because of the suit or is he great and hence he was capable of making the suit?). We pretty much know Tony will undergo this kind of a self-crisis, one, because it's natural to people to undergo at various stages of our lives and two, because of the overwhelming events Tony has experienced (he fought the god of thunder [Thor] in The Avengers and probably would have won, or at least continued to hold his own, so that has got to do something to the ego). We shouldn't be surprised that Pepper gets into her own Iron Man suit; not because she gets angry enough to suit up, but because the suit is a uniform, it's a visible statement about what the person in the uniform believes (that's why corrupt police shows are always so scandalous: the person wearing that uniform should be the symbol of justice because the uniform is the tangible expression of the law). 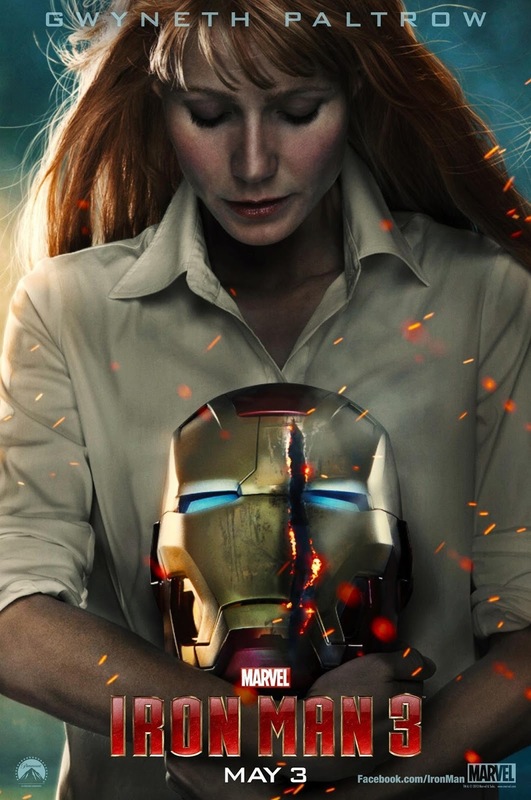 What is most important about Pepper, and her relationship with Tony, is that Pepper symbolizes the working class (the white-collar working class, granted, but Pepper still works) and she is the beloved of billionaire Tony Stark and she loves the owner of the company where she is employed; such a love relationship strongly establishes the relationship of business owners (Stark) and employees (Pepper). What happens with Pepper and Tony is meant to communicate to us, vividly, what has happened regarding the upper-class and working class. What a motley assemble! Given that director Shane Black wanted an "Uber Terrorist" to threaten Tony Stark and America, it's not surprising that we see so many iconic elements of the very things threatening the freedom of America. There is the ancient, Chinese robe, the cameo pants modern socialist guerrillas wear, the mythic ten rings (more on that below) and modern, expensive sunglasses worthy of Muammar Gaddafi (no telling what else we haven't seen yet). What we do know is the Mandarin is highly image conscious and there would be a reason for that: in today's world, image is everything, regardless of how many people you have or have not killed, and getting followers to your cause--to some--is merely a matter of image (consider, for example, how the liberal media protects the image of Obama from any sign of tarnish or fault for things that go wrong). Any villain you might think of while watching the Mandarin is probably meant to invoke that villain; for example, someone wrote that the Mandarin was impersonating the Joker when he says, "You'll never see me coming." ﻿﻿First of all, what is "Mandarin?" The most widely spoken language in the world, it is the official language of China and Taiwan. Why have Tony Stark's great enemy be called after the most popular language in the world? Well, it's probably because the things he will say in the film, the sentiments he will express in hating America and billionaires like Stark is that those ideas are the most widely held ideas in the world, that pretty much everyone hates America today. Do you remember what we discussed regarding Victoria and Julia in Oblivion? That the film seems to be suggesting our real mate is the Russians, not the British? 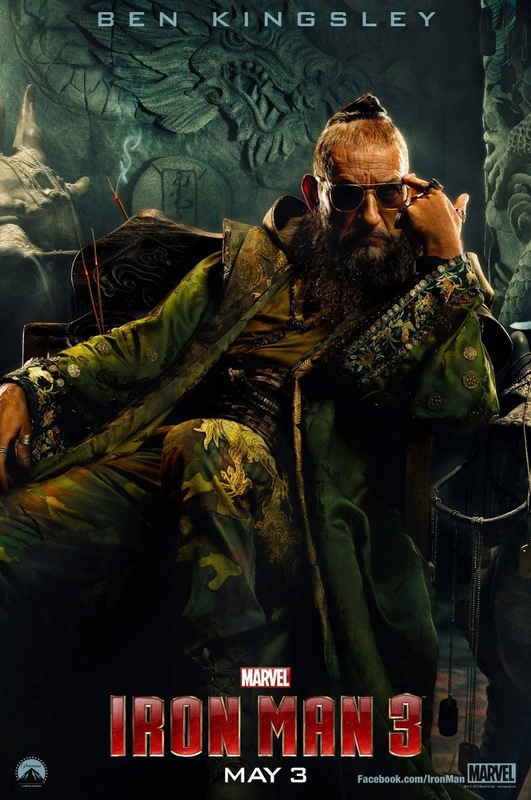 Keep that in mind when something is revealed about the Mandarin. I certainly wasn't expecting it. 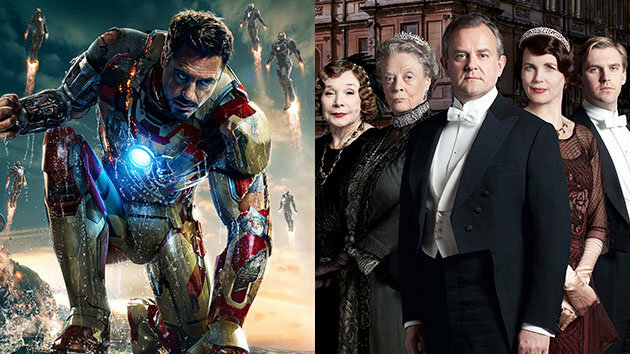 There are two Downtown Abbey scenes invoked in Iron Man 3; this is another perfect example of the implied and unimplied reader. 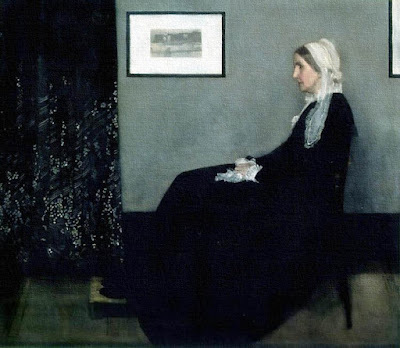 Because the film makers are big fans of the show, they carefully selected the scenes that would be playing in the background when certain events are taking place. Never having seen a single episode of Downtown Abbey, I qualify as the unimplied viewer because I have no knowledge I am bringing with me to the scene upon which I can draw references in further engaging with Iron Man 3; if you are a fan of the series, you are the implied reader, you have the knowledge base the film makers want to access to aide you in watching Iron Man and reward your devotion to the series with recognizing your favorite characters outside of the regular series. "Tom Branson (Allen Leech) is seen professing love to his dear Lady Sybil (Jessica Brown-Findlay) not once but twice," while Iron Man's Happy Hogan watches TV; why? both Hogan and Branson were chauffeurs (in Iron Man 3, Happy Hogan is promoted to Stark's security chief). You can read the entire article at this link for more; I would deeply appreciate fans of the series to email me with their interpretations as to why the specific scenes included (they are detailed in the link above) are where they are in the film and what you think they mean (the link above offers an interpretation). There are a number of times I have seen this example of "team work" at work: Snow White and the Huntsman, all the dwarfs jump on the rope to lift the main gate of Ravenna's castle; in The Dark Knight Rises, Commissioner Gordon and others victimized by the show trial, have to walk across the ice but, by spreading out, they avoid falling in to their deaths; In Oz the Great and Powerful, one of the group has gone too far on a cliff and the rest of the group struggle to keep them from falling. Keep that in mind. And last but not least, have fun! This is probably the biggest film of the year and I do hope you will enjoy it! I will be posting on Twitter after I get out of the theater, then getting the post up asap but it will probably be tomorrow before it's done but I will put all my effort into it!